If you are interested in the quickest of complete meals, this is what I ate most of last week after our move. We found a nearby restaurant that makes its own homemade fresh tofu. Tofu made without any preservatives, they warned us it would spoil faster than commercial tofu. We got some for take-away and quickly ate through it. I thought I knew a lot about tofu but this was different. Airy and light. (Despite my description, this is not silken tofu since they sell that too and I got the regular fresh tofu). Because it was so fresh, it was silky smooth and I did not feel the need to do anything to it. No marinade, no baking, no frying, simply nothing. It was a perfect addition to a quick salad. I added it to some other local specialties (fresh strawberries!) and made it into a simple salad after biking home from work. Pictured here with mixed greens and cucumber with a drizzle of mosto cotto, with a nod to my previous Vegan Green Power Bowl. 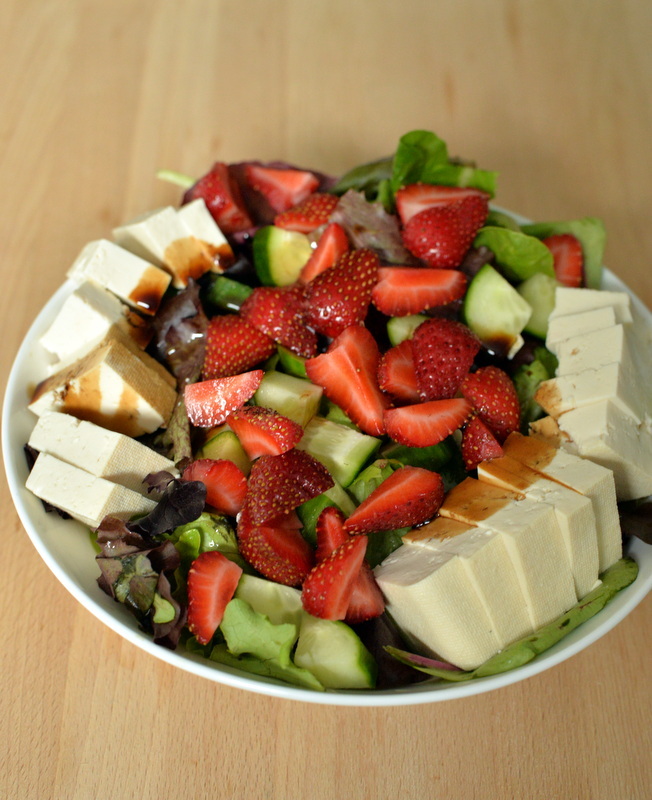 Do you ever eat plain tofu? Ie, straight from the package? If so, what is your favourite way to eat it? I am sharing this with Shaheen’s Eat Your Greens. 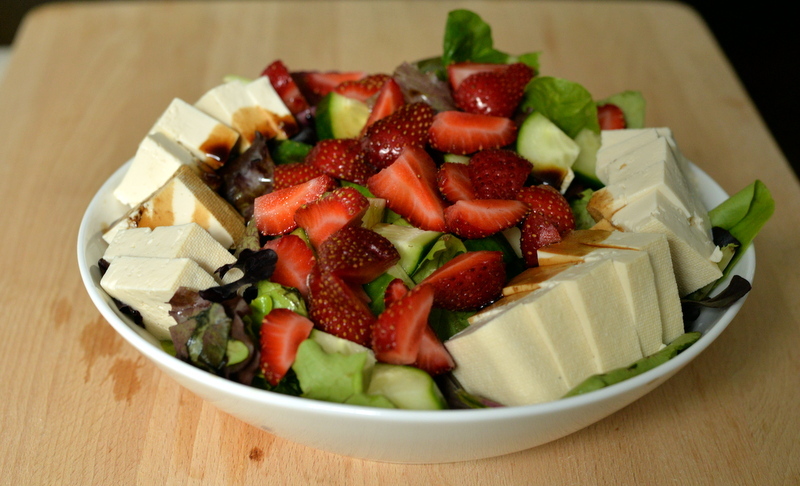 What a creative way to enjoy tofu! I have tried eating it plain before, but haven’t been a big fan. This sounds great though! Intriguing and unusual salad recipe Janet. 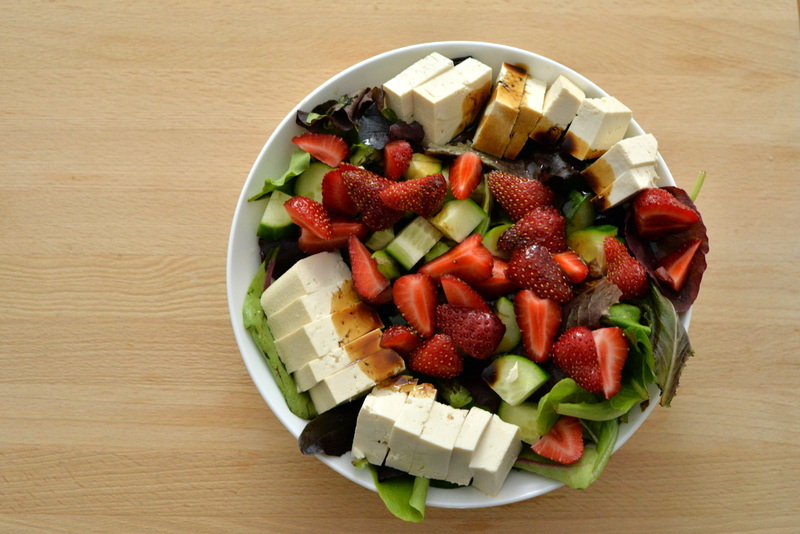 Thanks for sharing with EatYourGreens.